As part of the social responsiblity activities of the company, this year we decided to visit Balay Pasilungan at Datu Bago, Bangkerohan, Davao City. 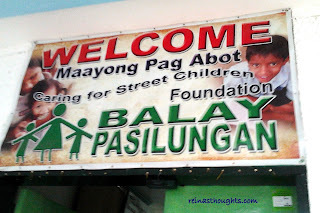 This is a foundation that cares and provides shelter for street children. 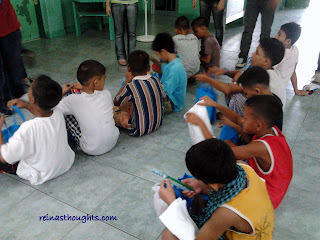 As of now, there were fourteen street children at their care. Doing community service is a very nice experience. It was self-fulfilling and let us appreciate more the blessings we are receiving. I am happy that the company is having this activity and that in our small way we could also be able to share our blessings. I hope other companies will also give importance to their social responsibilties to the community not only focusing on the financial status of their operation. I am happy to be able participate in this activity. Until the next community service. Every woman loves her shoes. There is no greater joy than buying a new pair and wearing them all the time. With Toms this joy is doubled because when you buy the shoe, a shoeless child gets to cover his feet!Every year it seems like shoe manufacturers come out with new materials to make shoes from including simulated leathers, rubber, and even plastic but it is a safe bet that leather will continue to dominate the designer shoe market for some time. [url=http://www.cheaptomsbuy.com]Cheap Toms sale[/url] The peculiar name of the shoe: Toms is not based on a person called Tom but on the popular usage of tomorrow as tom. It is based on the concept Shoes for tomorrow project. TOMS One-for-One Foundation" oversees the working of the TOMS charity program. [url=http://www.cheaptomssite.com]Cheap Toms[/url] It also allows the race sponsors to keep an eye on individual runners and if the sensor system sees something isn't quite right, it can notify emergency authorities who can dispatch a team right away. Granted, this is a blanket technology for the Marathon as it has had, in the past, as many as 26,000 runners leave Hopkinton for the 26.2 miles to Boston. So, it's of necessity that this is a rather large piece of technology, [url=http://www.tomsfans.com]Cheap Toms Sale[/url] "I want my patients to smile longer and brighter than they have ever before. This is why I am offering all new patients free whitening for life with their first appointment. I want my patients to maintain healthy teeth and gums throughout their lifetime and providing practice specials allows me to do that," said Dr. Stan Mahan, cosmetic dentist in Toms River. This product is powered by a lightweight Lithium Ion battery and is rechargeable with any Blackberry Travel Charger, Blackberry Power Station or any USB Cable or Automotive Charger. Features packed in the Blackberry HS-655 makes traveling light and easy. [url=http://www.icemachineschina.com]dvd car player[/url]Get all the various measurements and stats you can BEFORE you start shopping around for a car lift. Knowing the dimensions of your work space, your vehicle’s weight class and what features are most important to you will keep you firmly on track. DON’T forget about the cross bar on most two-post car lifts. You wrote something different than any other of blogs.